The Purim festival is on of Israel’s most widely celebrated festival, this is a deeply important festival in the Jewish calendar and today we are going to take a look at why the festival holds such importance, and how it is celebrated. If possible, we will try to break the history of the celebration down in a nutshell. At its most basic level, this festival is to celebrate the survival of the Jewish people after a decree was issued by the King in the 4th Century BC to kill all of the Jews. King Ahasuerus was the ruler of Persia during this time and when his wife, Queen Vashti disobeyed his orders, he had her executed. During a kind of beauty pageant to search for his next wife, he decided upon a Jewish girl named Esther who would become the new Queen, she never divulged her religious beliefs. There was a man named Haman, an anti-Semite who rose to become the Prime Minster of the Empire and in one incident, the leader of the Jews, Mordechai, also the cousin of Esther, refused to bow to the Prime Minister because of his hatred for the Jews. Enraged and embarrassed, the Haman convinced the King to issue a decree that all Jews would be killed on the 13th day of the Adar – Interestingly this is where the name Purim or ‘lots’ comes from as the day was chosen by way of a lottery. The Jews gathered behind Mordechai and Esther revealed her identity to both Haman and the King during a feast. The King reneged on the decree, had Haman killed and put Mordecai in his place as the Prime Minister. On the 14th day of the Adar, the Jews feasted like never before. Jewish unity is a key theme here and during the celebrations for Purim it is customary to give to the needs. Jews must give food or money to at least 2 people during daylight hours and they must place at least 2 coins in a collection box. The importance of togetherness and friendship is marked by sending food gifts to friends. Men send food to men and women to women and the food packages must contain at least two food items. What better way to celebrate survival than to feast, and that is exactly what happens during Purim. The table should be well decorated and the food be plentiful as the Jewish people celebrate with friends and family in a great feast. Songs from the Torah are sung as they enjoy various meats and wines. 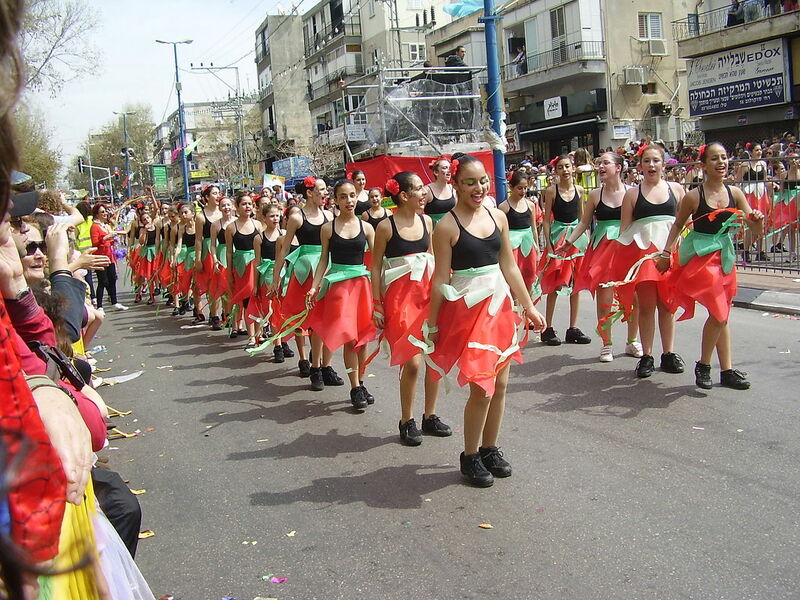 This sis the biggest festival in the Jewish calendar and if you are in Israel during this time then you can expect to see some grand celebrations. For over 3,000 years, the Iranian people have been celebrating a festival called Nowruz which is their New Year. The festival takes place each year between March 20th-23rd and signifies the first day of the Spring and the rebirth of nature. The Persian and Iranian New Year is one of the biggest celebrations of all the Persian festivals and is made up of various different customs as part of the overall celebrations. Let’s take a look at the past and the present of this incredible festival. The word Nowruz quite literally means new year and this is how the celebrations go down. For thousands and thousands of years, this time in the calendar has long been a celebration for many different religions and peoples, from the Zoroastars the Babylonians and to the Proto-Indo-Iranians as a celebration of the end of the winter. The vernal equinox signifies the beginning of the spring in the Northern Hemisphere, the rebirth of nature and the time when crops can once again be sewn. This is a celebration that is enjoyed by many different people’s and religions to this day but the largest by far is by the Iranian people by way of Nowruz. There are many different parts of the overall celebrations and we are going to take a look into a few of the ways in which the people enjoy the festival. Some days before the New Year, a special cover called the cloth of seven dishes is placed on the Persian carpet or table in the household. The number 7 is sacred in Persian tradition and seven dishes are placed on the cloth to represent the seven angelic heralds of the life-rebirth. Sprouts, Samanu pudding, Apple (Seeb), Senjed (fruit from the locust tree,) Garlic (Seer,) Somaq berries and vinegar (Serkeh) are all laid out n the table. Other items can be placed on the table which represent hopes for the future, these range from coins for wealth, eggs for fertility, a mirror for reflection and sometimes an orange floating in a bowl of water to represent the Earth in space. The actual beginnings of the celebration are on the eve of the final Wednesday of the year. Many bonfires are made and family members will jumping over the bonfire and chant “Give me your redness and take away my wintry sallow complexionˮ. When the fires go out, the ashes are collected and planted in the fields to represent the burial of the previous year. The heralding of the New Year is this character who signifies a fire-keeper, a man from the village will dress up in a red get-up complete with black face and red hat. 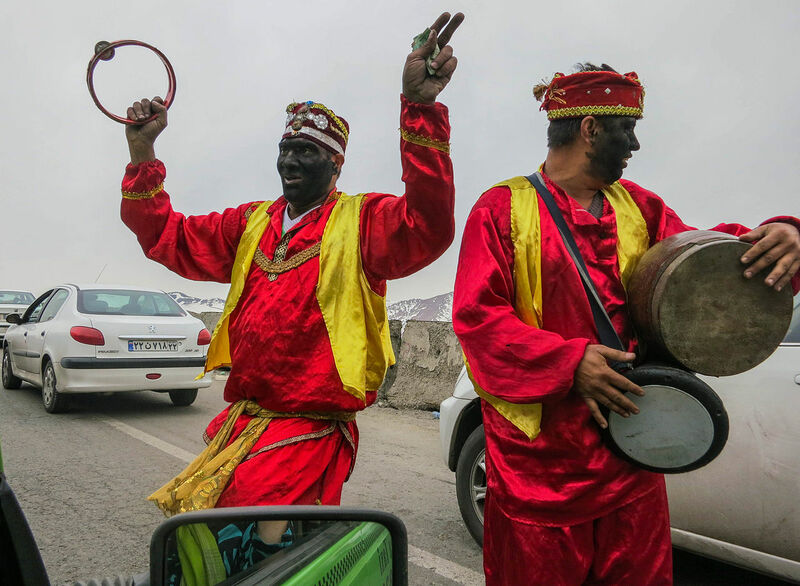 People will gather around Haji Firuz and chant, sing and play the tambourine to celebrate the New Year. This occurs on the 13th day of the year and sees families take to the great outdoors to celebrate nature. They will take picnics and enjoy games in the fields. The sprouts (sabzeh) which have been kept on the tables or in the homes will be thrown into the fields to rid bad luck form the house and to make the nature greener. And that is the celebrations of the Iranian New Year or Nowruz.